Few American university locations offer the unique blend of urban and natural landscapes found in the Madison, Wisconsin area. The Department of Planning and Landscape Architecture is located only 1.5 miles from downtown Madison. Connected to the city by bus, students and faculty enjoy a close proximity to the museums, libraries, theatres and cultural institutions. Furthermore, the many lakes, trails, bike paths, parks, and open spaces serve as unique places for outdoor recreation. Madison’s governmental and cultural institutions provide a laboratory for the study of architecture, urbanism and food systems unequalled by any other location in the United States. Likewise, the resources of state, regional, and local governments and the expertise of those who work within those groups regularly complement the programs within the school. The unique urbanism and architecture of Madison is only part of the advantage of the University of Wisconsin–Madison’s location. Nearby Milwaukee and Chicago provide contrasting examples of architecture, urbanism, history, local culture and development patterns. For example, Chicago is the home to Daniel Burnham’s famous Plan of Chicago, which influenced many other city plans since its inception in 1909. 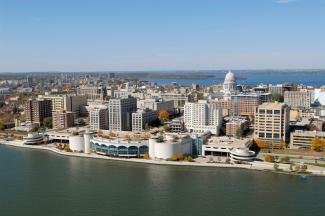 UW–Madison’s location in the metropolitan region provides its particular advantages. Within a five-hour drive, one can reach the small vacation towns of Wisconsin’s Door County, the scenic byways of western Wisconsin following the Mississippi River, the streets and skywalks of Minneapolis, and the masterpieces of Frank Lloyd Wright, John Nolen, and Aldo Leopold to name but a few. For directions, parking, and lodging information for the University of Wisconsin–Madison, see the Campus and Visitor Relations website. The Department of Planning and Landscape Architecture is currently housed in different spaces on campus. If you wish to visit DPLA, email us to schedule an appointment. To reserve a spot on the daily guided walking tour or schedule a customized group visit, see the Campus and Visitor Relations website.